Copies of “Sunflowers” by Zhao Xiaoyong, left, and by another painter in Dafen. Wong, now an assistant professor in the University of California Berkeley’s rhetoric department, apprenticed with Zhao over the course of several months, and learned how to paint “Sunflowers.” She documented his instructions in a new book, “Van Gogh on Demand: China and the Readymade,” which looks at the recent interest of the contemporary art world in Dafen’s strange trade. A standard-size 20-x-24-inch painting can be completed by the master and an apprentice in two to three hours, plus an additional week to dry. Most of the painters of Dafen, as Wong notes, have no formal training in oil painting, nor does their work require the originality we associate with a painter like van Gogh. But they have developed extraordinary skill at making paintings that look like a product of both. 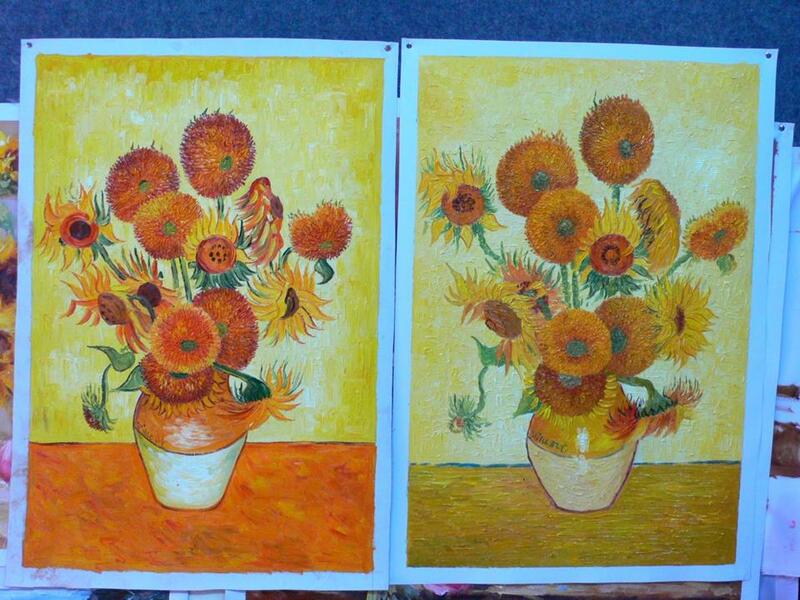 Eight stages for two van Gogh “Sunflowers,” as copied by Zhao Xiaoyong and the author. 1. Tack a blank canvas of the required size onto the drawing board. 2. Tape a one-inch border around the canvas with masking tape. This leaves the necessary space to stretch the canvas onto wooden strainers later. 3. Tack up another “Sunflowers” painting from the shop for reference. 4. Mix quick-dry medium into titanium white. 5. Prepare the palette with large amounts of lemon yellow, medium yellow, cadmium red orange and titanium white, and smaller amounts of rose madder, burnt sienna, forest green, and cerulean blue. 6. Using leftover dirty paint anywhere in the yellow-to-red spectrum, sketch out the overall composition. Start with assigning the location of the vase’s opening, the edge of the table, and then outline the shape of the vase. Draw six ovals with smaller inner circles where the six round sunflower blossoms should be. Mark out the ovals of the other flower blossoms, and the dried leaves near the vase. 7. Paint the first layer of the background: Using a ¼” brush, lightly combine two dabs titanium white and one dab lemon yellow. Make sure not to mix the two pigments together too much, and to leave traces of pure pigment in the mixture. Load this onto the brush. In a “井 ”-character pattern (that is, two horizontal lines followed by two vertical lines), fill in the background. Work lightly. Do not pull too hard or the effect of each thick brushstroke will be lost. Be sure that each brushstroke is visible. Be light and at ease. Do not grip the brush tightly. Remember to keep loading pure pigment onto the brush. 8. After the whole background is painted, use a 1/8” brush to paint over the whole background again with the same two pigments and the “井”-character pattern, this time loading more paint onto the brush with every stroke. Make it brighter in the center, darker at the edges of the painting. 9.Repeat the same two-layer process with the table, using long horizontal strokes. This time use equal amounts of lemon yellow and medium yellow on the ¼” brush. Add in a few green strokes for depth. 10. Paint the upper part of the vase using medium yellow and cadmium red orange, mixing in some burnt sienna and rose where needed. Paint the lower part with lemon yellow, medium yellow, and white. Remember to paint the vase as a rounded volume. 11. With the same brush, pick up amounts of lemon yellow and medium yellow, and fill in the large blossoms in very short strokes, turning each stroke towards the center of the blossom. Add darker yellows as necessary to round out the volume of the blossoms. 12. Taking a palette knife, pick up equal amounts of two yellow pigments with the back tip of the knife. Dab or dot the paint in a circular pattern with light strokes pulling outward from the center of each blossom. 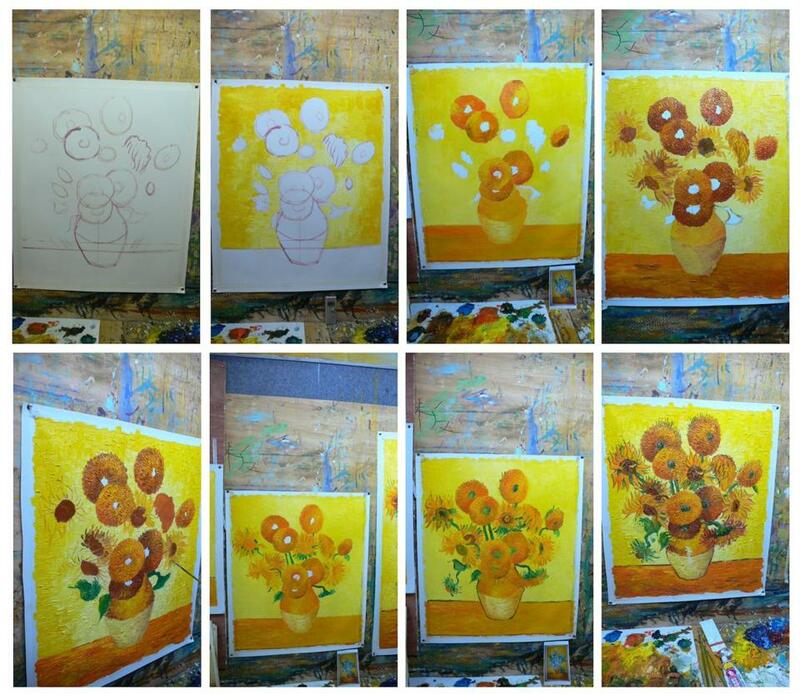 Progressively add darker yellows, orange, and sienna in order to round out each blossom. Work lightly and don’t scrape into the wet paint. 13. With the 1/8” brush, paint in the blossom petals in profile. 14. Using another 1/8” brush, load with dark green pigment and freehand draw each leaf. Make it look natural, like a leaf. 15. Using the same brush, fill in the center of each flower with three strokes of green, sienna, and a dab of cerulean blue. 16. Using the same brush but adding a trace of lemon yellow, paint in the stems. 17. Using the palette knife, dab white highlights on the vase, drag yellow highlights onto the green leaves, and dab white highlights on buds. Using the 1/8” brush with dark dirty paint on it, use the dirty paint on the palette and mix in dark green to get an off-black, then outline some of the vase and table, some leaves, and some blossoms.